The Kel-Tec P-11 is one of the smallest and lightest 9mm made. Thanks to it's locking dynamics and superior ergonometry, perceived recoil and practical accuracy are comparable to much larger guns. 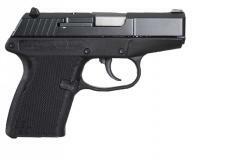 The P-11 is especially suited for plain clothes police officers or as a secondary weapon for military personnel. All machined components are also made on modern high speed computerized equipment. Equally advanced quality control equipment and test procedures ensure a firearm with uncompromising quality in materials and workmanship. Available with a 10 round magazine capacity and choice of parkerized, hard chrome or blue finishes.